Elizabeth Salter, wife of Thomas William, (EH I26); died 20th May 1920, aged 72. Enlisted in Hastings, serving as Sapper 238066 in the Royal Engineers. Killed in action 26th April 1918. Commemorated on Panel 72-75 of the Tyne Cot Memorial. Born about 1882 in Hastings, son of the late Thomas and Elizabeth Salter. Husband of Edith Jane Salter of 83, Southwater Road, St Leonards. 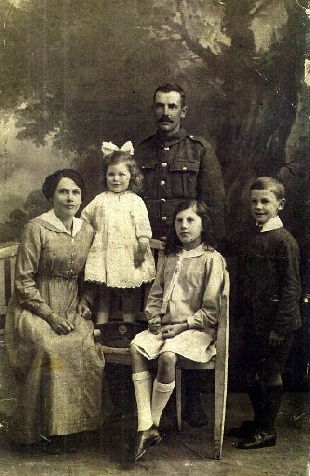 Archibald, aged 28, Carpenter, born at St Leonards, Edith, his wife, children, Dora Edith, aged 4, and Edward, aged 1. Also Mary Ann Hopgood, Mother in law, aged 64. Archibald Salter, builders' foreman and machinist, of St. Leonards. Applicant in the employ of his brother, Mr. T. Salter.— Three months granted. Adjourned until end of September Archibald Salter, 33. machinist etc.. employed by T. Salter, builder. St. Leonards.- Conditional exemption for three months, some public service. BUILDER AND HIS MACHINERY. Archibald Salter, general service, machinist and works foreman Messrs. T. Salter, builder, asked for further time'. lt was stated that the man was indispensable and all efforts to find a successor had failed. He had charge of several machines and if he went the business would hav« to be closed and the machinery would have to be idle until after the War or until somebody came back.— One month, final.